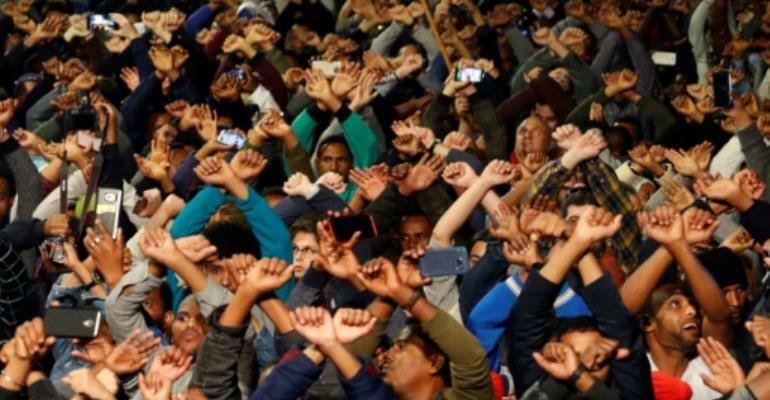 Israeli police said they detained two men, one armed, after they allegedly made online threats to disrupt a rally Saturday in solidarity with African migrants facing expulsion. A police spokesman told AFP that "well over" the anticipated figure of 5,000 people took part in the rally in the Neve Shaanan area of south Tel Aviv, where many of the migrants have settled. The two suspects were "detained for questioning" after a Facebook post apparently calling for a violent counter-protest, police said in a statement. "Friends it's happening... the battle to throw out the infiltrators," said the post, reproduced in a police statement. "It's time to riot and defend our home." The term "infiltrators" is used by Israeli authorities and supporters of mass deportation to refer to the migrants, who began entering Israel illegally through what was then a porous border with Egypt in 2007. Police said comments posted in response to the Facebook entry included: "I am armed." "Israel police immediately located the two suspects, detained them for questioning and at the conclusion confiscated from one of the suspects his weapon," the statement added. A smaller counter-protest was taking place nearby, Israeli media said, but there were no reports of friction between the two sides. Police were out in force and said they would not tolerate public disorder. In 2012, an anti-migrant demonstration in Tel Aviv drew about 1,000 participants and spiralled into a race riot in which there were shouts of "Blacks out!" and attacks on African-run shops. Saturday's solidarity event was initiated by Israeli residents of Neve Shaanan but organisers said they hoped that people would come from all over Israel to show support. The interior ministry says there are currently about 42,000 African migrants in Israel, half of them children, women or men with families. Single men have been given the choice of leaving Israel by early April or facing indefinite imprisonment. Most are from Sudan or Eritrea and say they would be at risk if repatriated. A man identifying himself only as Taj told AFP at the rally that he was from war-ravaged Darfur in western Sudan and had fled seeking asylum. "I came from Darfur where genocide is happening since 2003 and I came here seeking protection," he said in English. "Unfortunately the (Israeli) government doesn't know how to deal with me as an asylum claimer and I'm still waiting for an answer from them," he said. Acknowledging that some could face danger if returned home, Israel is proposing to send them to an unnamed third country, which migrants and aid workers say is Rwanda or Uganda. The policy has drawn criticism from the United Nations refugee agency as well as some Israelis. "We think it's a racist decision and it's a dangerous decision,' demonstrator Hila Aloni said. "We are standing here together, Israelis and refugees and we want to live here together in this country." Academics have published a petition and Israeli Holocaust survivors wrote an open letter to Prime Minister Benjamin Netanyahu last month pleading with him to reconsider. Religious and conservative leaders, including Netanyahu, have presented Muslim and Christian migrants as a threat to Israel's Jewish identity. His government is considered the most rightwing in Israel's history. On Wednesday, hundreds of asylum-seekers at a detention centre in southern Israel launched an open-ended hunger strike after several of them were transferred to prison in the Negev desert for refusing to leave the Jewish state voluntarily.